The research was performed by JQI postdoctoral scientists Christopher Varney and Kai Sun, JQI Fellow Victor Galitski, and Marcos Rigol of Georgetown University. The results appear in an editor-recommended article in the 12 August issue of the journal Physical Review Letters. You can't pour a spin liquid into a glass. It's not a material at all, at least not a material you can touch. It is more like a kind of magnetic disorder within an ordered array of atoms. Nevertheless, it has many physicists excited. To understand this exotic state of matter, first consider the concept of spin, which is at the heart of all magnetic phenomena. For instance, a refrigerator magnet, at the microscopic level, consists of trillions of trillions of iron atoms all lined up. Each of these atoms can be thought of loosely as a tiny spinning ball. The orientation of that spin is what makes the atom into a tiny magnet. The refrigerator magnet is an example of a ferromagnet, the ferro part coming from the Latin word for iron. In a ferromagnet, all the atomic spins are lined up in the same way, producing a large cooperative magnetic effect. Important though they may be, ferromagnets aren't the only kind of material where magnetic interactions between spins are critical. In anti-ferromagnets, for instance, the neighboring spins are driven to be anti-aligned. That is, the orientations of the spins alternate up and down (see top picture in figure). 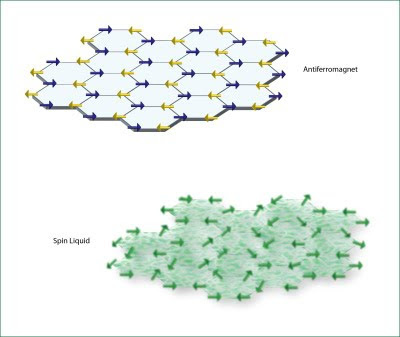 The accumulative magnetic effect of all these up and down spins is that the material has no net magnetism. The high-temperature superconducting materials discovered in the 1980s are an important example of an anti-ferromagnetic structure. More complicated and potentially interesting magnetic arrangements are possible, which may lead to a quantum spin liquid. Imagine an equilateral triangle, with an atom (spin) at each corner. Anti-ferromagnetism in such a geometry would meet with difficulties. Suppose that one spin points up while a second spin points down. So far, so good. But what spin orientation can the third atom take? It can't simultaneously anti-align with both of the other atoms in the triangle. Physicists employ the word "frustration" to describe this baffling condition where all demands cannot be satisfied. In everyday life frustration is, well, frustrating, and actually this condition is found throughout nature, from magnetism to neural networks. Furthermore, understanding the different manifestations of a collection of magnetically interacting spins might help in designing new types of electronic circuitry. One compromise that a frustrated spin system makes is to simultaneously exist in many spin orientations. In a quantum system, this simultaneous existence, or superposition, is allowed. Here's where the JQI researchers have tried something new. They have studied what happens when frustration occurs in materials with a hexagonal (six sided) unit cell lattice. What these atoms do is interact via their respective spins. The strength of the interaction between nearest neighbor (NN) atoms is denoted by the parameter J1. Similarly, the force between next nearest neighbors (NNN) -- that is, pairs of atoms that have at least one intervening atom between them -- is denoted by J2. Letting this batch of atoms interact among themselves, even on a pretend lattice as small as this, entails an immense calculation. Varney and his colleagues have calculated what happens in an array of hexagons consisting of 30 sites where the spins are free to swing about in a two-dimensional plane (this kind of approach is called an XY model). Christopher Varney, who has appointments at Maryland and Georgetown, said that the interactions of atoms can be represented by a matrix (essentially a two-dimensional spreadsheet) with 155 million entries on each side. This huge number corresponds to the different spin configurations that can occur on this honeycomb-structured material. What the researchers found were a "kaleidoscope" of phases, which represent the lowest-energy states that are allowed given the magnetic interactions. Just as water can exist in different phases -- steam, liquid, and ice -- as the temperature is changed, so here a change in the strengths of the interactions among the spins (the J1 and J2 parameters) results in different phases. For example, one simple solution is an antiferromagnet (upper picture in figure). It's difficult for the human mind to picture a tiny two-dimensional material in so many states at the same time. JQI fellow, Victor Galitski, suggests that one shouldn't think of the spins as residing at the original atomic sites but rather as free ranging particle-like entities dubbed "spinons." These spinons bob about, just as water molecules bob about in liquid water (see lower picture in figure). Hence the name quantum spin liquid. Another reason for using the word liquid, Galitski says, is this 'bobbing about' is analogous to what happens inside a metal. There, the outer electrons of most atoms tend to leave their home atoms and drift through the metal sample as if they constituted a fluid, called a "Fermi liquid." Electrons in a metal are able to drift since it takes only an infinitesimal amount of energy to put them into motion. The same is true for the fluctuating spins in the hexagonal model studied by the JQI scientists. Indeed, their spin model assumes a temperature of absolute zero, where quantum effects abound. Writing in an essay that accompanied the article in Physical Review Letters, Tameem Albash and Stephan Haas, scientists at the University of Southern California, say that the JQI/Georgetown team "present a convincing example" of the new spin liquid state. How can this new frustration calculation be tested? The experimental verification of the spin liquid state in a 2-dimenstional hexagonal lattice, Albash and Haas suggest, "will probably be tested using cold atoms trapped in optical lattices. In the past few years, this technology has become a reliable tool to emulate quantum many body lattice systems with tunable interactions." Indeed the authors propose such an experiment. What would such a spin liquid material be good for? It's too early to tell. But some speculations include the idea that these materials could support some exotic kind of superconductivity or would organize particle-like entities that possessed fractional electric charge. "Kaleidoscope of Exotic Quantum Phases in a Frustrated XY Model" by Christopher N. Varney, Kai Sun, Victor Galitski, and Marcos Rigol, Physical Review Letters, 107, 077201, (12 August 2011).